Apple kept everyone hopping last week with new hardware, updates to all its operating systems, and a strong earnings report. 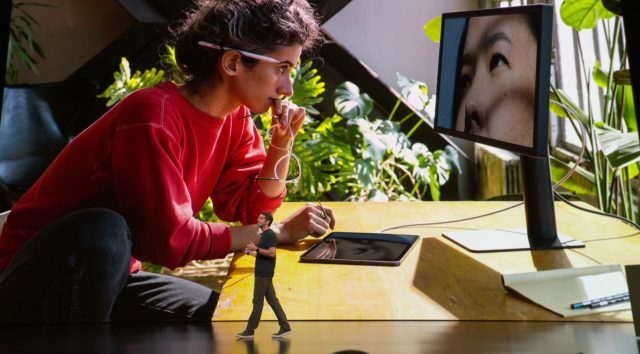 First up was the company’s release of long-awaited updates to the MacBook Air and Mac mini, along with a new iPad Pro that integrates Face ID and supports a redesigned Apple Pencil that significantly improves on the original. 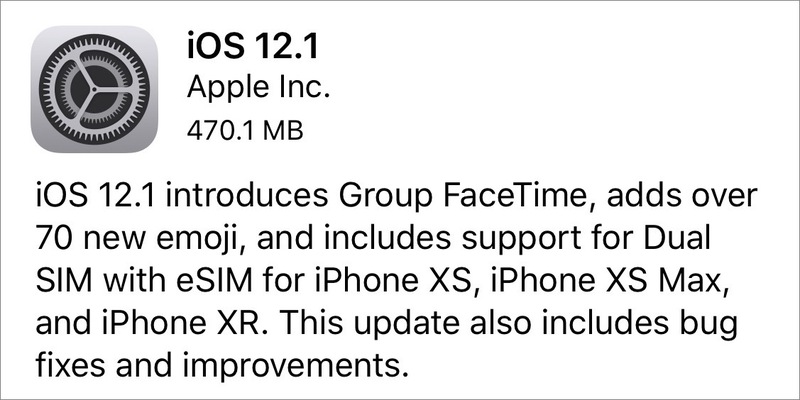 Alongside the new hardware came iOS 12.1 and macOS 10.14.1, which add the delayed Group FaceTime feature, plus smaller updates to watchOS 5.1.1, tvOS 12.1, and iOS 12.1 for HomePod. Finally, Apple’s Q4 2018 earnings once again set records, but investors were spooked by flat and declining unit sales, as well as Apple’s refusal to release those numbers in the future. Notable Mac app releases this week include Safari 12.0.1, Security Update 2018-002 (High Sierra) and Security Update 2018-005 (Sierra), SpamSieve 2.9.34, ScreenFlow 8.2, Agenda 2.6, and Luminar 2018 1.3.2. Reporting on its fiscal 2018 fourth quarter financial results, Apple has announced net profits of $14.1 billion ($2.91 per diluted share) on revenues of $62.9 billion. 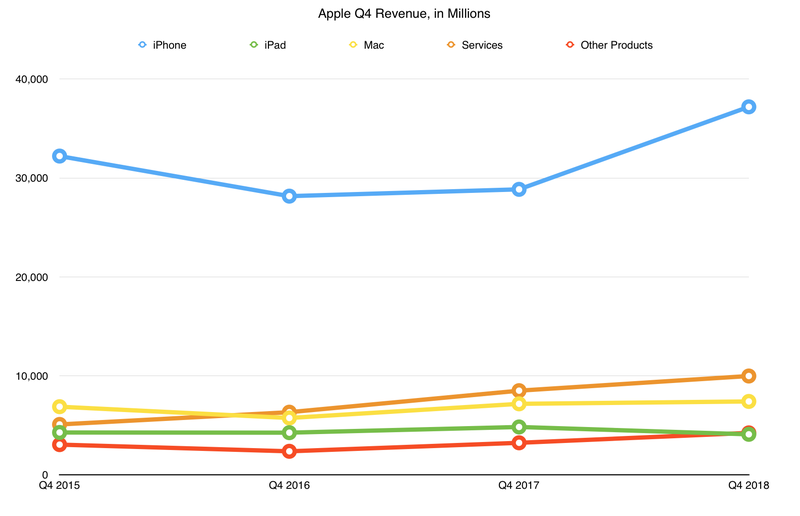 The company’s revenues are up 20% compared to the year-ago quarter, with quarterly earnings per share up by 41% (see “Apple Posts Strong Q4 2017 Financial Results,” 2 November 2017). A standout contributor to Apple’s spoils this quarter was its Services business segment, which brought the company $10 billion in revenues, an all-time record and a 17% increase year-over-year. Services revenues have increased steadily for the past few years and have become an increasingly important component of Apple’s income. Apple now claims over 330 million subscriptions across its entire ecosystem, with 30,000 third-party subscriptions in the App Store. As good as Services revenues were, though, they weren’t Apple’s revenue leader. Predictably, iPhone sales brought Apple the biggest chunk of its quarterly income, achieving $37.2 billion in sales, compared to last year’s $28.8 billion, a 29% increase. This increase happened, notably, in the face of essentially flat iPhone unit sales. The most logical explanation is the higher selling prices of the iPhone X, XS, and XS Max. In other words, Apple is squeezing more from its existing customer base. This pattern of higher revenues despite flat or declining unit sales continued with the Mac. Although Mac unit sales were down by 2% year-over-year (5.299 million units versus 5.386 million), Mac revenue was up by 3%, adding $7.41 billion to the company’s total revenue. This represents a quarterly record for Mac revenues. The iPad was Apple’s only product segment that showed both declining unit sales and declining revenues year-over-year—6% fewer unit sales and 15% less revenue. This comparatively large revenue decline associated with a smaller unit sales decline likely represents a larger percentage of lower-cost iPads, such as the $329 iPad introduced earlier this year, in the sales mix. Despite Apple’s heavy investment in the iPad product line, its tablets simply aren’t moving well compared to the rest of the company’s offerings. But the iPad is still big business, bringing in over $4 billion last quarter, and it remains a fundamental component of Apple’s Everyone Can Code program, which now includes 5000 schools. 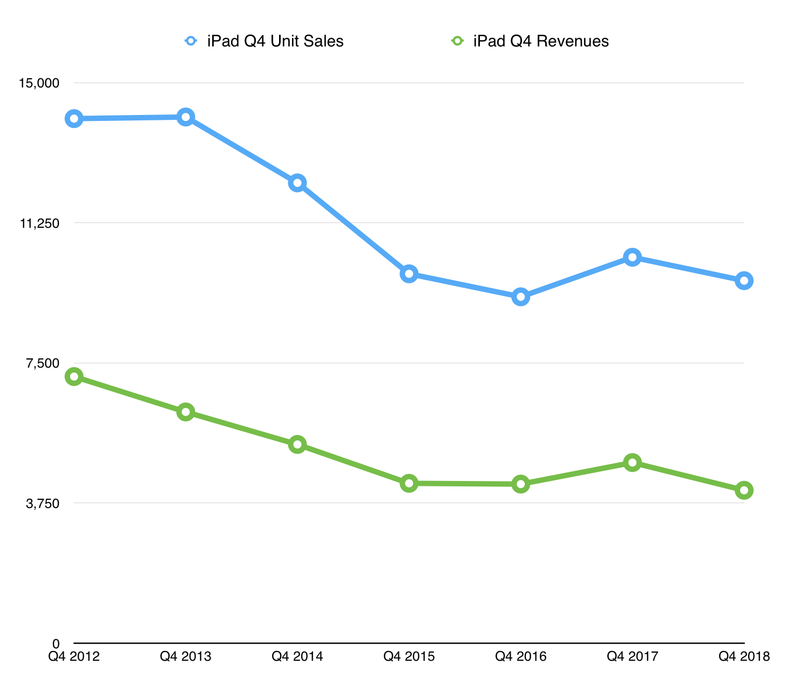 Note, too, that these iPad revenue and sales numbers don’t reflect the 2018 iPad Pro since it was introduced after the quarter ended. CEO Tim Cook called Q4 a record quarter for the Apple Watch, but we still don’t know exactly what that means. However, Apple’s Other Products category—which includes the Apple Watch, Apple TV, HomePod, Beats electronics, accessories, and other stuff—had a 17% revenue increase year-over-year. Apple continued to perform well internationally, with 61% of its sales coming from outside of the United States. Income from each of the company’s foreign market segments, from Europe to Greater China, was up, with Greater China’s $11.4 billion in revenues amounting to a 16% rise year-over-year. Apple’s flagship hardware products seem to have hit a unit sales wall. Apple has responded by raising prices to better capitalize on the existing customer base. But with unit sales flat or declining, can Apple continue to raise prices, especially with a growing trade war with China? That said, the release of the new MacBook Air, Mac mini, and iPad Pro may significantly improve both unit sales and revenues for the Mac and iPad segments as customers satisfy pent-up demand for long-ignored products. Services and Other Products remain strong areas of growth for Apple. In other words: expect more subscription services and accessories like the Apple Watch and HomePod. Cook clearly believes that the iPad is the future of computing, but the market doesn’t seem to agree. There have been a few bright quarters—particularly Q4 2017—thanks to Apple’s heavy investment in the product, but the overall trend for several years has been a decline in iPad sales. If the new iPad Pro doesn’t turn things around, it may be time for Apple to admit that the iPad ultimately is not going to be the future of computing, but merely an adjunct to the Mac and iPhone. We’ll take another look at these numbers in Q1 2019—which encompasses the holiday season—to see what the overall trend may be. Unfortunately, Apple announced during its quarterly investor call that it will no longer be sharing quarterly unit sales, and will in the future only report revenues. That will make establishing the health of a product more difficult, since revenue numbers, while essential, are just only one part of the equation. Along with the Macs and iPads it unveiled at its special event in Brooklyn, Apple today released a slew of operating system updates: iOS 12.1, macOS 10.14.1 Mojave, watchOS 5.1, tvOS 12.1, and iOS 12.1 for HomePod. Collectively, they add Group FaceTime, more emojis, and other features to the Apple ecosystem. As always, it’s wise to wait a few days to see what issues might crop up from these updates before installing. Lending credence to our advice is the fact that watchOS 5.1 bricked enough devices that Apple pulled the update temporarily and has now replaced it with watchOS 5.1.1.
iOS 12.1 brings the delayed Group FaceTime feature, dual SIM support for the iPhone XS and XR, camera improvements, new emoji, and more. The update weighs in at 438.9 MB on the 10.5-inch iPad Pro and 470.1 MB on the iPhone X, and you can obtain it in Settings > General > Software Update or install it through iTunes. 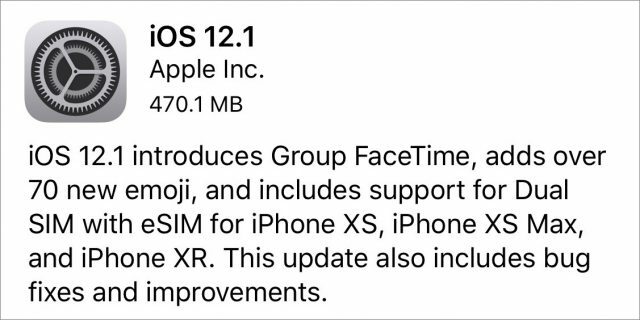 The marquee feature of iOS 12.1 is Group FaceTime, which Apple delayed from the initial iOS 12 release (based on our internal testing over the summer, with good reason!). Note that while all iOS 12 devices support Group FaceTime, older devices are limited to audio-only calls. That set includes the iPhone 5s, iPhone 6, and iPhone 6 Plus, along with the iPad mini 2, iPad mini 3, and iPad Air. To start a Group FaceTime call, tap the + button in the FaceTime app, enter a contact name in the To field, and then, after choosing a contact, simply start adding another. When you’re ready to start the call, tap Audio or Video to kick things off. You can also start a Group FaceTime call from a group Messages conversation by tapping the group name at the top of the screen and then tapping the revealed FaceTime icon. Each participant’s picture appears in a tile. Audio-only callers are represented by an icon with their initials. During a call, you can tap the More (•••) button to reveal the Add Person option. If you’re invited to a Group FaceTime call, you receive a silent notification or message that you can tap at any time to join. If things don’t seem to be working, tap the green camera icon to start the call. Group FaceTime works on the Mac too, with macOS 10.14.1 Mojave or later. More on that below. We tried Group FaceTime last week, but we’re sad to report that we can’t recommend it right now—it was confusing to use, worked poorly, and was visually annoying when it did work. Some of the problems may be teething pains, but the usability issues will require software updates. We’ll keep trying it, but Google Hangouts remains our preferred solution for group video calls. On the iPhone XS and XR, you can now adjust the depth control in real time before you take a photo in addition to adjusting it in the captured image. To do so, tap the f-stop control in the top-right corner of the screen, drag the depth control slider to adjust the image, and when you’re satisfied, tap the shutter button to take the picture. Apple also claims that it has fixed excessive skin smoothing in selfies taken with the iPhone XS and XR, a problem dubbed (sigh) “Beautygate” by the press. Apple says that it was caused by a bug in the software’s Smart HDR processing. You must have an iPhone XS or XR. To use two different carriers, your iPhone must be unlocked. Your carrier must support eSIM. In the United States, that means AT&T, T-Mobile, and Verizon. Dual SIM functionality is a bit finicky and complex, but Apple has a thorough guide on how to use it. iOS 12.1 adds over 70 new emoji, such as red-haired people, bald people, superheroes, and even bagels. Yay. Emojipedia offers a complete list of every new emoji in iOS 12.1.
iOS 12.1 also features 24 security fixes. 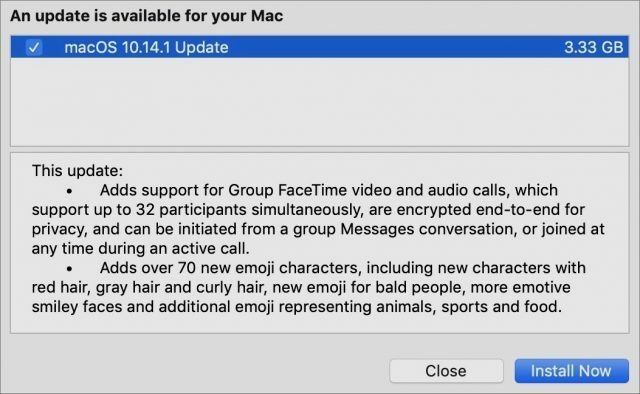 The highlights of the macOS 10.14.1 update are Group FaceTime and the aforementioned new emoji. To install the 3.33 GB update, go to System Preferences > Software Update—you can no longer update from the App Store app. By the way, if you were running a beta of Mojave, 10.14.1 won’t appear in the Software Update preference pane. Instead, as Dan Moren noted at Six Colors, you need to get Mojave from the App Store app first, which will cause Software Update to install 10.14.1. The way you initiate Group FaceTime calls in Mojave is nearly identical to iOS 12, except that in Messages, you click Details to reveal the FaceTime buttons. The macOS 10.14.1 update includes 52 security fixes. Now that Apple has released watchOS 5.1.1 to address the problems suffered by version 5.1, you can once again consider updating, although we still recommend waiting a few more days, just in case. The key new features of the 133 MB watchOS 5.1.1 update would seem to be support for Group FaceTime audio and the aforementioned new emoji, but Apple’s release notes don’t even mention them. As far as we know, fall detection shipped with watchOS 5.0, so we’re not sure why Apple is calling it out now. The watchOS 5.1 update also included 14 security fixes. 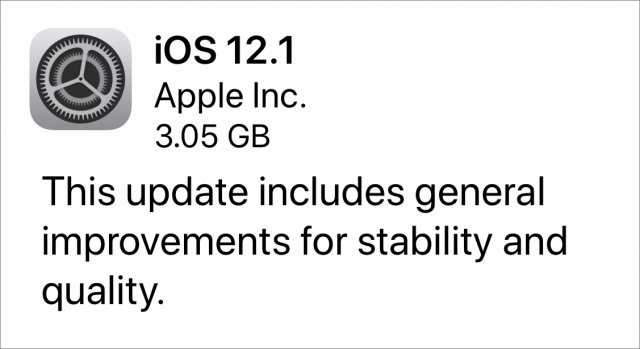 The tvOS 12.1 update “includes general performance and stability improvements” and 11 security fixes. If automatic updates aren’t on, you can update your fourth-generation Apple TV or Apple TV 4K by going to Settings > System > Software Updates. Finally, in an almost entirely silent update that will install itself automatically if you don’t get to it first via the Home app, iOS 12.1 for the HomePod “includes general improvements for stability and quality.” Bet you didn’t see that new wording coming! At the company’s scheduled special event at the Brooklyn Academy of Music, Apple executives and attendees alike were unusually energetic and enthusiastic. That may have been due in part to quantities of jet-lag-busting caffeine for those flying in from the West Coast, or the presence of lots of Apple retail employees in the hall, but we’d like to think it was more due to the excitement surrounding the update to the MacBook Air. With all due respect to the MacBook Pro, Tim Cook called the MacBook Air “the most beloved notebook ever” and invoked the memory of Steve Jobs pulling the original MacBook Air out of an envelope. 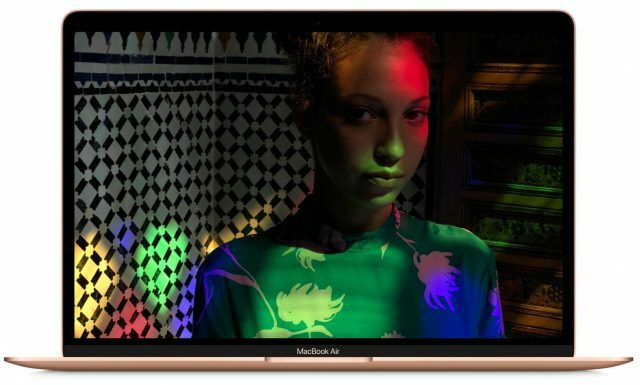 Fans of the model, including many of us here at TidBITS, have waited a long time for an update—the previous version of the 13-inch MacBook Air remained untouched since June 2017 with the release before that coming in March 2015. The most significant change to the new MacBook Air’s specs is the inclusion of a 13.3-inch Retina display. Previously, the display maxed out at a resolution of 1440 by 900; now it boasts a native resolution of 2560 by 1600 at 227 pixels per inch. 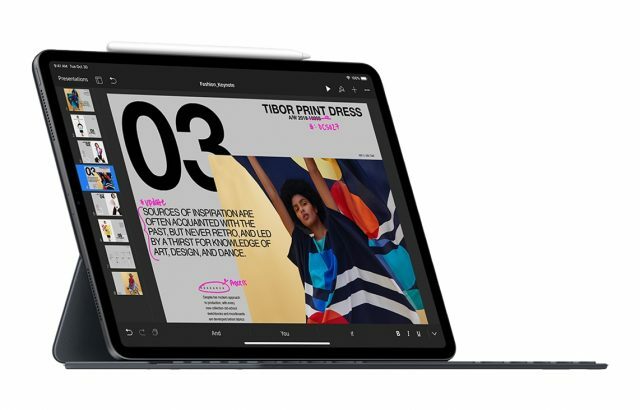 Specs don’t do Retina displays justice, however, and speaking as someone who has used a non-Retina MacBook Air for many years, I think this change alone will make the new MacBook Air significantly more competitive with Apple’s other laptops. Driving that screen is an eighth-generation 1.6 GHz dual-core Intel Core i5 processor with Turbo Boost up to 3.6 GHz and 4 MB of L3 cache. The previous model had a 1.8 GHz dual-core Intel Core i5 whose Turbo Boost only went up to 2.9 GHz and that had only 3 MB of L3 cache. However, you could also bump the previous model to a 2.2 GHz dual-core Intel Core i7; there is no CPU upgrade option for the new MacBook Air. In its press release, Apple talks about performance only generally, saying “delivering the performance you need for everyday activities like organizing your photos, browsing the Web, creating presentations or viewing and editing videos.” Reading between the lines, that says to me that the new MacBook Air isn’t notably faster than the previous model when it comes to pure processing power. Check out the comments for benchmark discussions. However, Apple does say that the SSDs in the new MacBook Air are up to 60% faster than the previous model, which will speed up launching apps and opening large files. Also, the previous model’s SSDs maxed out at 512 GB, whereas the new model starts at 128 GB and lets you upgrade to 256 GB for $200, 512 GB for $400, or 1.5 TB for $1200. In terms of graphics processing, Apple moves from the previous model’s integrated Intel HD Graphics 6000 to Intel UHD Graphics 617. The company said nothing about how that might affect performance, so again, I suspect it’s not significantly better. If you want faster graphics, you can connect an eGPU (external GPU) via Thunderbolt 3. I can’t see anyone bothering to do that with a MacBook Air; if you care deeply about faster graphics, get a 15-inch MacBook Pro, which comes with a Radeon Pro and can soon be configured with a Radeon Pro Vega for even more performance. Finally, the previous MacBook Air started with 4 GB of RAM and let you upgrade to 8 GB when you ordered. The new model starts at 8 GB and lets you upgrade to 16 GB for $200. Frankly, I recommend the 16 GB—you won’t regret it. The new RAM is also faster, at 2133 MHz, up from 1600 MHz. There’s no Touch Bar in the new MacBook Air—it seems that Apple isn’t really serious about it as an alternative control device for the Mac in general. However, the new MacBook Air does feature a Touch ID sensor in the upper-right corner of the keyboard. That will improve security and ease working with Touch ID-capable software like 1Password. Although Touch ID is extremely welcome, it’s interesting that Apple chose not to jump to Face ID as it did for the new iPad Pro, which has roughly the same physical limitations. We suspect that Face ID may be more expensive or that there may be engineering challenges with integrating it into macOS, but it’s hard to imagine Apple won’t go there in the future. The main change that gave us pause is Apple’s reliance on the third generation of its butterfly-switch keyboard, which has proved controversial in the MacBook Pro due to short key travel and key failures. If keyboard feel is all-important to you, you’ll want to give this one a try in person before buying. The company made a big deal about how each key is backlit with its own low-power LED for more accurate illumination, but I have to say, accuracy in key backlight levels doesn’t even appear on my priority list. Apple’s switch to the new Force Touch trackpad is largely uncontroversial. We’ve heard hardly any complaints about it, and those were mostly about it being too big. It’s 20% larger than the Multi-Touch trackpad in the previous model and provides additional capabilities. Unsurprisingly, Apple dropped nearly all the ports from the previous model, replacing USB-A, Thunderbolt 2, MagSafe 2, and an SDXC card slot with a pair of Thunderbolt 3 ports on the left side. As with the MacBook Pro, you’ll use the Thunderbolt 3 ports for charging and connectivity. Those Thunderbolt 3 ports also support up to one 5K external display or two 4K displays. Although the new MacBook Air suffers from the same annoying dongle requirements as the MacBook Pro, the audience for this Mac is less likely to be stressed about it. However, if you want to connect an external display and a hard drive for backup while still charging, you’re going to need a special cable or Thunderbolt 3 dock. The only other port is the 3.5mm audio jack, which moves to the right side. However, you might not have to pop in those earbuds since the new MacBook Air features redesigned stereo speakers that are 25% louder and have twice the bass. It also has three microphones, up from two in the previous model, and retains the 720p FaceTime camera. Gone is the aluminum bezel around the screen—the new MacBook Air has a much thinner black bezel. Apple took advantage of that change to reduce the size of the MacBook Air significantly, boasting that it’s 10% thinner, has 17% less volume, and at 2.75 pounds (1.25 kg) is about 7% lighter. So it’s quite a bit smaller and lighter than the previous model, which is welcome. The industrial design, which is thicker at the hinge and tapers to the front edge, remains the same, although it’s a touch thinner in the back and thicker in the front. Apple spent quite a bit of time in the presentation talking about how the aluminum case in the MacBook Air is now made entirely of 100% recycled aluminum. That’s a good thing. The new MacBook Air starts at $1199 for a configuration that includes 128 GB of storage and 8 GB of RAM as the only build-to-order options. However, you can choose from space gray, gold, and silver, which, happily, don’t affect the price at all. You can place an order now for delivery starting on 7 November 2018. During the presentation, everyone in our SlackBITS channel was extremely positive about the changes Apple brought to the MacBook Air, and in general, I agree. However, as I was writing this article and comparing the new model against other machines in Apple’s laptop lineup, I’m a bit more conflicted. It’s not the specs; it’s that $1199 price. That’s because the non-Touch Bar MacBook Pro costs only $100 more and bests the new MacBook Air in nearly every way other than Touch ID, a 1.5 TB SSD option, and 120 grams of weight. That MacBook Pro offers significantly better performance thanks to its 2.3 GHz dual-core Intel Core i5 or 2.5 GHz dual-core Intel Core i7. Also, its Retina display can display more colors and at 500 nits is brighter than the MacBook Air’s 300-nit screen. For $200 less, you can still buy the older model of the MacBook Air, which has all the old ports but is larger and heavier, and lacks the new model’s Retina display and Touch ID. Even more oddly, Apple has retained the 12-inch MacBook, an overpriced, underpowered machine hobbled by a single USB-C port. At $1299, it’s more expensive than the MacBook Air, and the only reasons to buy it remain its diminutive size and weight. If you look at Apple’s Mac model comparison page, you can see that the company is now selling six laptops in five form factors, and it’s now even harder to decide among them. We could see that as an embarrassment of riches, or we could just wish that Apple would better differentiate its models by price, size, and performance. Even though it weighs in at a svelte 1.03 pounds (468 g), the new 11-inch iPad Pro that Apple announced at its October 30th event in Brooklyn packs a burly set of features, as does its 12.9-inch sibling, which is just 1.39 pounds (631 g). These new additions to the iPad lineup mark several big breaks with prior models. First of all, the new iPad Pro has neither a Home button nor Touch ID unlocking. Instead, behind the screen’s thin black bezel is a new 7-megapixel TrueDepth camera that handles Face ID authentication like the iPhone X series and enables support for Animoji, Memoji, 1080p HD video recording, Portrait Mode, and Portrait Lighting stills. It even has a flash for low light, employing screen lighting with a feature Apple calls Retina Flash. Also, unlike the iPhone, the iPad Pro can detect faces in both portrait and landscape orientation. Second, there’s no more Lightning connector. Instead, the iPad Pro now has a USB-C connector for charging and connecting with peripherals. This makes the new iPad Pro more compatible with third-party charging devices and lets you easily connect an external monitor. It also allows Apple to sell yet another dongle (a USB-C to 3.5mm headphone jack adapter). Third, the new iPad Pros sport a magnetic attachment area and wireless charging capability for the new Apple Pencil, which no longer needs to hang precariously off the bottom of your iPad as you give it a quick charge. Speaking of charging, one of these new iPad Pros, with the appropriate USB-C-to-Lightning cable, can now charge an iPhone. Finally, although the 11-inch iPad Pro retains the physical footprint of its 10.5-inch predecessor despite its larger screen, the 12.9-inch iPad Pro keeps the same screen size and slims its dimensions down to the point where it’s roughly the same size as an 8.5-by-11-inch piece of paper. Both models have flat edges with rounded corners, a design approach last seen in the iPhone 5s. An improved 12-megapixel rear camera to take advantage of Apple’s latest computational photography capabilities, like Smart HDR. Alas, it does stick out of the back slightly, much like the newer iPhones. With these new iPad Pros come new peripherals: a new Apple Pencil and new Smart Keyboard Folio. The new Apple Pencil features several welcome evolutionary enhancements. It incorporates a touch-sensitive surface so you can double-tap it to change drawing modes, a feature already supported in Apple’s iOS 12.1 apps and coming soon in third-party apps. The easy-to-lose cap is gone since, as mentioned earlier, you no longer plug it in to charge it. Instead, you just set the flat edge of the Apple Pencil on the magnetized side of your iPad to dock it, charge it, and pair it via Bluetooth. It’s now a quintessential Apple device, with no ports, connectors, buttons, or moving parts of any kind. And that flat edge means it won’t roll off the table anymore. Along with a new Apple Pencil is a new keyboard, the Smart Keyboard Folio. Attaching magnetically to the back of the new iPad Pro models, these keyboard covers use a redesigned Smart Connector and provide two viewing angles when deployed as a keyboard. Unlike the previous Smart Keyboard, the Smart Keyboard Folio protects both the front and the back of the iPad Pro when closed. 11-inch iPad Pro: The smaller model starts at $799 for a Wi-Fi-only model in silver or space gray with 64 GB of storage. Want more space? 256 GB will cost you $949. 512 GB breaks the thousand-dollar barrier by a fair amount, running you $1149, and the 1 TB model will deplete your savings by an impressive $1549. Add $150 per model for cellular connectivity. 12.9-inch iPad Pro: For a larger screen, add $200 to the price of each of the 11-inch models. For example, the base model of the 12.9-inch iPad Pro starts at $999 and tops off at $1749—for a Wi-Fi-only device. Again, cellular capability adds another $150 per model. Apple Pencil and Smart Keyboard Folio: Apple’s accessories got more expensive. The new Apple Pencil will set you back $129, up from $99, and the new Smart Keyboard Folio costs $179 for the 11-inch Pro and $199 for the 12.9-inch Pro tablet, up from $159 and $169, respectively. Although you can place an order for one of these new iPad Pro tablets now, they won’t arrive until at least 7 November 2018, according to the Apple online store, and some configurations are now reporting arrival dates as late as 21 November 2018. So if you want one soon, get your order in quickly. Or, if you want to save $150, you can still purchase last year’s 10.5-inch iPad Pro for $649. Until today, no current Apple hardware product has been more forgotten or forlorn than the Mac mini. The compact, monitor-less Mac had not seen a significant update in over 4 years, and even that update was seen as lackluster (see “Apple Launches iMac with Retina Display, Refreshes Mac mini,” 16 October 2014). Many thought the Mac mini was dead. Apple has now put such beliefs to rest, revealing a revamped—though familiar—Mac mini during its special event at the Brooklyn Academy of Music in New York City. In terms of industrial design, the new Mac mini is not a radical revision amid a push in the PC world to create palm-sized, ultraportable computers. It looks much like its predecessor—a large, square, metal slab with rounded corners and the Apple logo on top. 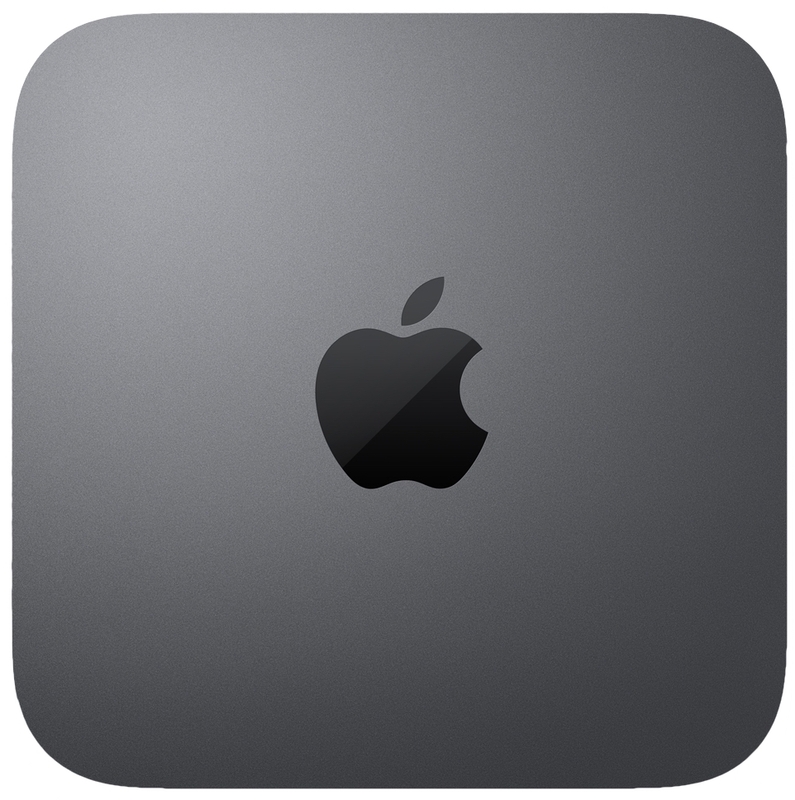 The new Mac mini is 7.7 inches (19.56 cm) square and 1.4 inches (3.56 cm) tall, exactly like its predecessor, and it weighs 2.9 pounds (1.32 kg), just a shade heavier than its 2.7-pound (1.22 kg) precursor. As Apple executives pointed out repeatedly during the presentation, the company is aiming this new Mac mini at professionals who use it for live performances, rendering video, running specialized hardware, and more. With the new model, Apple points to a “massive” Mac mini performance increase compared to the previous version, which is welcome but hardly surprising given how puny the old Mac mini was. Eighth-generation Intel Core processors that start with a 3.6 GHz 4-core i3 version that’s common in low-end Windows-based PCs or a 3.0 GHz 6-core i5. For $200, you can move up to a 3.2 GHz 6-core i7 chip with Turbo Boost of up to 4.6 GHz. Apple claims up to five times the performance compared to the previous Mac mini, and up to 60% speedier graphics performance thanks to the switch to Intel UHD Graphics 630. 8 GB of RAM of the 2666 MHz DDR4 SO-DIMM variety in configurations of 16 GB ($200), 32 GB ($600), and 64 GB ($1400). The old model maxed out at 16 GB. Apple says the new memory is up to 7.8 times faster than the older model. 128 GB of SSD storage with upgrades to 256 GB ($200), 512 GB ($400), 1 TB ($800), and 2 TB ($1600). Apple is claiming four times the previous read speed, up to 3.4 GB/s sequential read speed. The new T2 security chip with a Secure Enclave coprocessor for encrypted storage and secure-boot capabilities. Unsurprisingly, the new Mac mini will run hotter than its predecessor, and Apple has adjusted to this with a new thermal-dissipation system that circulates air in and out of the computer at twice the previous rate while, the company claims, keeping the computer whisper quiet. The Mac mini has always been notable for its plethora of ports, and the new model is no exception. The selection this time around includes four Thunderbolt 3 ports and an Ethernet port—with an option for 10-Gigabit Ethernet—along with a standard HDMI 2.0 port, a 3.5 mm headphone jack, and two legacy USB-A ports supporting USB 3.0. Annoyingly for a machine that professionals are going to be stuffing in racks, the Mac mini still has no ports on the front. Photographers may be disappointed that there’s no camera-card slot on the front or back. As a headless Mac, the Mac mini has long served the needs of those who want the flexibility to add a display (along with a keyboard and mouse or trackpad) of their choosing. The Mac mini’s Thunderbolt 3 ports support native DisplayPort output over USB-C. With the right adapters, users of legacy displays can also do Thunderbolt 2, DVI, and VGA output via those ports. DVI is also supported through the HDMI port, with an adapter. You can order the new Mac mini now, with a 7 November 2018 arrival date. The 4-core i3 configuration with 8 GB of memory and 128 GB of storage starts at $799, and a 6-core i5 version with 8 GB of memory and 256 GB of storage starts at $1099. Even though it’s more expensive than its predecessor, which opened at $499, the new Mac mini is the only modern Mac whose entry-level configuration falls below the magical $1000 price point. However, build-to-order options will increase the price quickly because Apple charges a steep premium for RAM and storage. A maxed-out Mac mini would run nearly $4200, although dropping to the second tier RAM and SSD options would drop that to $2600. You can buy and install RAM from other vendors to save some money. If you don’t already have a monitor, keyboard, and mouse, you might also want to take a look at Apple’s entry-level 21.5-inch iMac, which starts at $1099. It has similar specs, including a seventh-generation 2.3 GHz dual-core Intel Core i5 processor, 8 GB of memory, and a 1 TB hard drive, not to mention its integrated 1920-by-1080 display. Just make sure to swap that poky hard drive for a Fusion Drive or SSD. 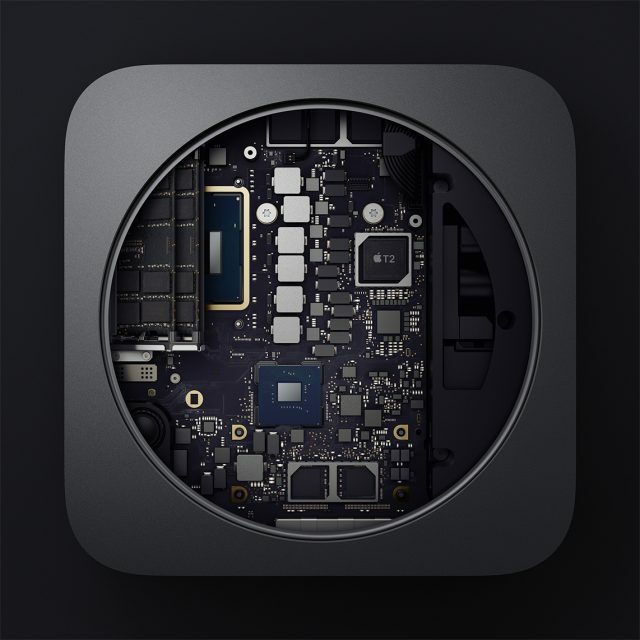 Nonetheless, the new Mac mini is sure to find an audience among those who already have peripherals on hand, and who want an affordable, compact Mac that can be easily tucked into tight spaces while serving a myriad of uses. It may be a bit pricey for an individual’s home media server, but anyone who needs a tiny Mac for live performances or that can be stacked to make render farm, the Mac mini is once again a serious solution. Michael Tsai of C-Command Software has released SpamSieve 2.9.34 with improvements in how the spam filtering utility works with Mail in macOS 10.14 Mojave. The app now better detects when Mail has finished launching before checking that its plug-in is enabled, ensures that SpamSieve detects if macOS has forgotten that you gave SpamSieve Full Disk Access, adjusts the launch agent so that SpamSieve more reliably launches when Mail launches, and protects you from a disabled plug-in when Mail launches after SpamSieve launches (such as when using SpamSieve with multiple mail clients). Skylum has issued version 1.3.2 of its Luminar 2018 photo editor with a new AI Sky Enhancer feature that enables you to enhance the sky in your images with artificial intelligence and a single slider. The filter can recognize sky in most photos as well as distinguish between water and other elements. It also detects objects in the foreground and their edges for perfect masking—get more details from this Luminar blog post. The update also improves performance when opening documents that contain Luminosity masks, increases stability when exporting TIFF files with 8-bits-per-channel bit depth, ensures that all filters and Looks that include the Grain effect work properly, improves speed of sliders, and enhances the Crop tool so that you see a grid view while changing the angle of the image. Due to recent security changes at Facebook and Twitter, the capability to post directly to a social network from Luminar has been temporarily removed in macOS 10.14 Mojave. 9to5Mac reports that Apple is launching a pilot program to repair “vintage” devices that the company had previously stopped supporting because they haven’t been manufactured for 5 to 7 years. The program will start with the iPhone 5, 2012 MacBook Air, and 2011 iMac, and will soon include the iPhone 4s and 2012 MacBook Pro, followed by even more Mac and iPhone models. However, repairs are contingent on part availability, so Apple isn’t guaranteeing that it will be able to repair your ailing 11-inch MacBook Air. Apple’s recent focus on supporting older devices bolsters its environmental efforts, but this pilot repair program also coincides with a brewing fight over Right to Repair legislation in many US states. Apple may be hoping that expanding its repair options will reduce the likelihood that such legislation will force it to design its notoriously closed products for easier repair. SmugMug purchased Flickr from Yahoo in April (see “SmugMug Buys Flickr from the Remains of Yahoo,” 24 April 2018), and is now revamping the service. First up, Flickr will limit free accounts to 1000 photos starting 8 January 2019. After that, users with more than 1000 photos won’t be able to upload new photos. Simultaneously, Flickr is enhancing its $49.99-per-year Flickr Pro plan with unlimited photo storage, 5K photo support, ad-free browsing, and more. In a blog post, Flickr Vice President of Product Andrew Stadlen explained that the change is aimed at refocusing the service around photography enthusiasts, reducing reliance on advertising, and making Flickr more sustainable.